The Grambling State University football team will look for its third straight win and second consecutive Southwestern Athletic Conference (SWAC) victory this weekend as the Tigers face off against SWAC East Division rival Alcorn State on Saturday. The two teams are no strangers to each other and have met in the SWAC Championship for the last three seasons. 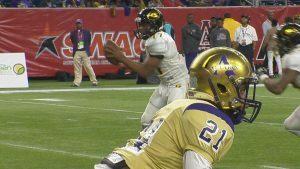 Alcorn took the 49-21 victory in 2015, but Grambling State has won the last two conference crowns (27-20 in 2016 and 40-32 in 2017). Key Player: LB De’Arius Christmas just continues to dominate on the Tigers’ defense. Last wee he led the Tiger defense with eight total tackles, including seven solo stops. He had a pair of sacks and one interception – his second of the season as he helped Grambling State to a 34-21 win against conference opponent Texas Southern. He’ll need to be on top of his game again to take on the Braves, but he’s been a prime time performer before against them. Fantasy Bonus Baby: QB Geremy Hickenbottom had a great day last week against Texas Southern, who passed for 345 yards and scored 3 touchdowns. The assignment this week is tougher, but look for him to possibly have another big day. Alcorn hoists a nationally ranked defense that is second in the country in tackles per loss per game (9.0), third in third down percentage defense (.289), third in sacks per game (4.0), fourth in total yards (251.0 ypg), seventh in red zone defense (.667) and ninth in passing yards allowed (160.3 ypg). The Alcorn offense leads the SWAC in scoring (34.1 ppg), total offense (472.4 ypg), rushing (293.7 ypg) and first downs per game (21.9). The Braves have used a three running back and two quarterback system. The Braves are coming off a 35-26 victory over Alabama A&M to spoil their Homecoming. Alcorn broke a 10-10 tie at half with an explosive second to win its fifth straight over AAMU. Key Player: QB Noah Johnson leads the Braves in passing yardage (1,028 yards, 6 TDs) and is also a potent rushing threat (539 yards, 7 TDs). Though Alcorn uses multiple QBs, Johnson is the guy who is the bigger overall threat. Fantasy Bonus Baby: RB De’Shawn Waller has come on strong as of late. He’s coming off back-to-back 100-yard rushing games including a career-high 214 yards and two touchdowns against Alabama State. Waller won back-to-back SWAC Newcomer of the Week awards after games against Southern and ASU. Fearless Prediction: A growing Rivalry between two of the best teams in the SWAC, this one might come down to special teams. Once again, Alcorn gets let down by their kicking game as Grambling continues their SWAC surge. Grambling 30, Alcorn 21.